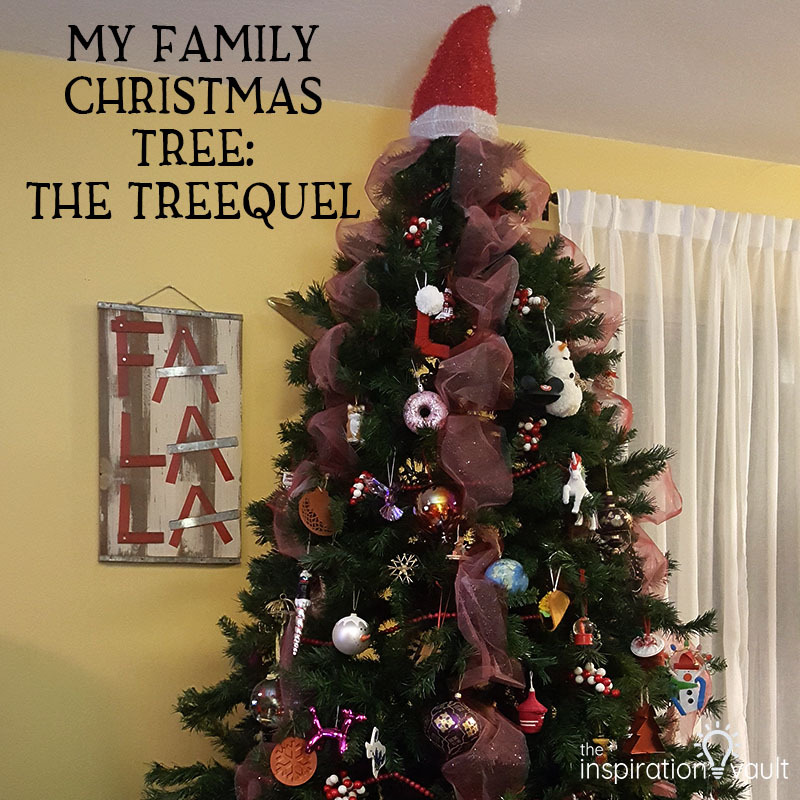 I’m back again this year with the “treequel” to the My Family Christmas Tree post! 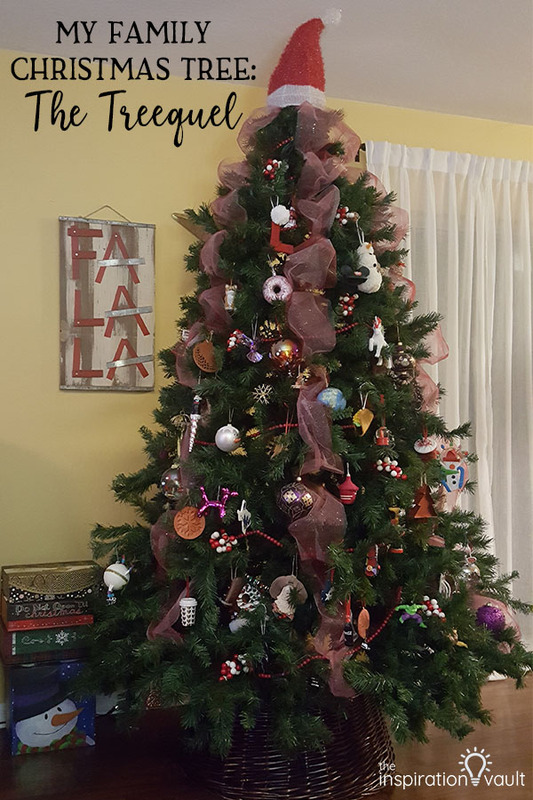 I’ve made a few changes to the tree’s decor and of course, I’ve added several more ornaments and retired just as many. There is only so much room on that tree! Speaking of, I’m pretty sure this is the last year for the tree as well. He has served us honorably for many years now, but I think he’s reached the threshold of still looking nice after losing so many needles and having the branches bent and adjusted so many times. So let’s get to the good part, the Christmas Tree! I happened to eat at a Cracker Barrel restaurant on a day they were having an ornament sale and I ended up walking away with 10 ornaments! 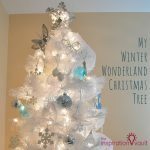 They had so many beautiful, and funny, and cute ornaments to choose from, I ended up getting some for this Christmas Tree and some for My Winter Wonderland Tree and my Traditional Gone With the WInd Tree as well. 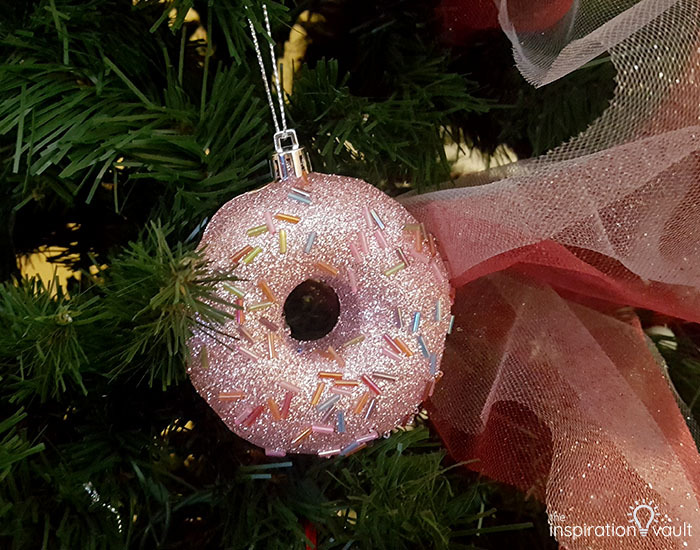 This sparkly donut glass ornament is even nicer in person and I couldn’t resist it. The big, round one is a red blown glass balloon and it has some real weight to it. 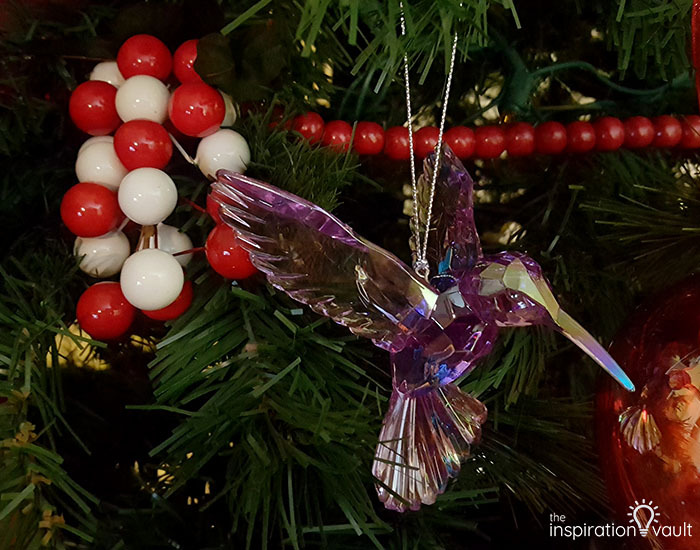 Then the purple crystal hummingbird ornament is so very gorgeous I can’t stop staring at it. 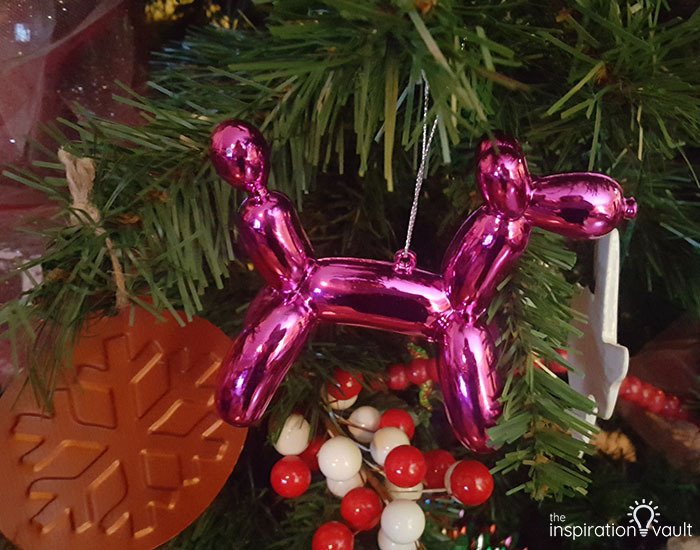 And that leaves the pink balloon animal ornament, which is far heavier than the real thing since it’s made of metal. 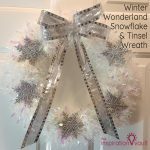 I’ve managed to make a few more new handmade ornaments this year as part of the Ornament Exchange as well as the 12 Days of Christmas Ideas. I sent a tree version of this copper ornament to my exchange partner in Canada and loved it so much I had to make a version for my Christmas Tree, too. 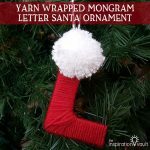 This Yarn Wrapped Monogram Letter Santa ornament is fun for kids (and adults) to make and this Dollar Tree Rustic Mickey Ears Ornament is as well. 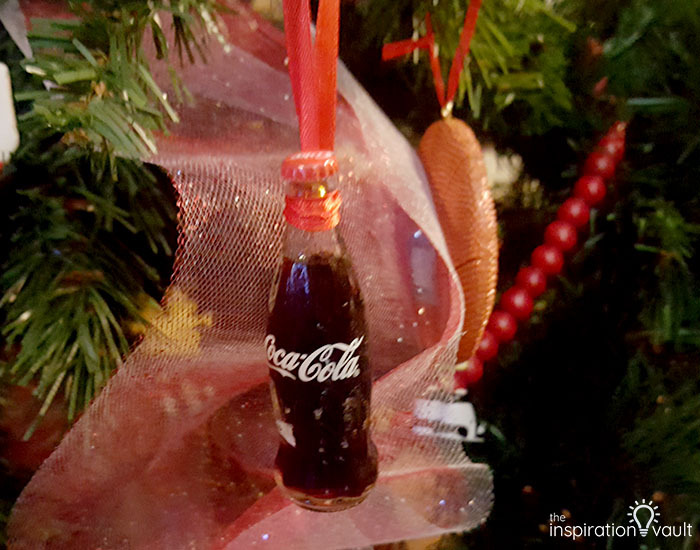 I got this really cute Coke ornament from the Coca-Cola Museum in Atlanta when I visited and it has real Coke inside of it! 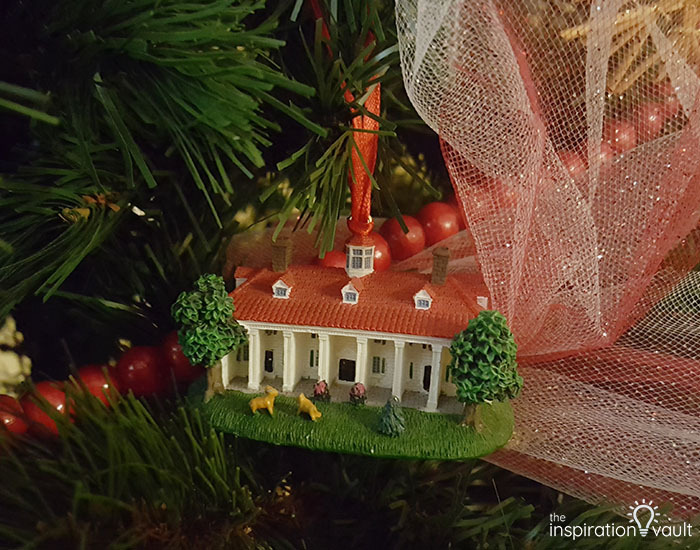 And then I got the Mount Vernon one when I visited while living in D.C. 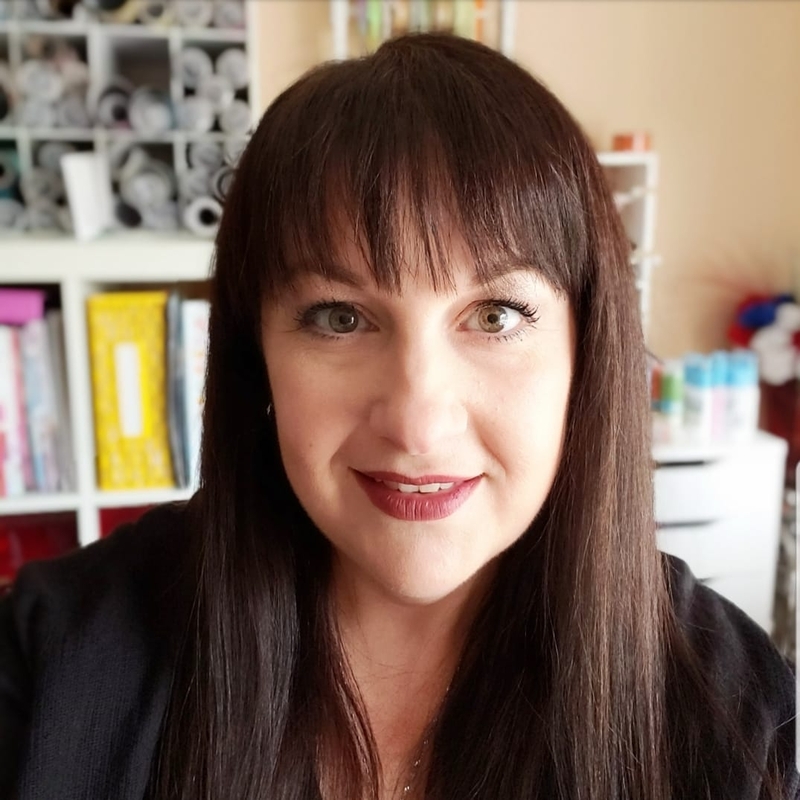 I love this Hogwarts ornament since it has all four houses, but I’m still on the lookout for a cool Deathly Hallows ornament. I’m not saying I’m starting a Harry Potter collection, but they do have some great ornaments to choose from at the Universal stores. 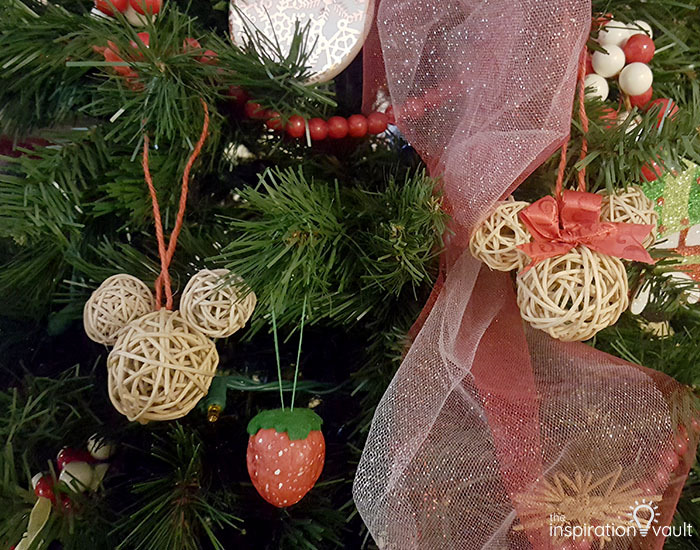 Can you believe I haven’t grabbed any ornaments from the Disney Christmas shops yet? I know! I tend to shop their ornaments year round, but this year I just kept saying, oh I’ll get some closer to Christmas. Well here we are, less than a month out and I’ve only bought this Disney Food & Wine Festival ornament. 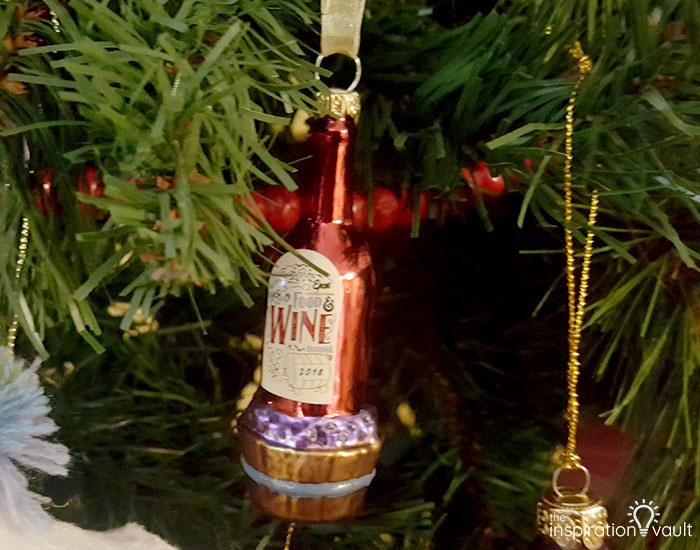 It’s a cute little wine bottle glass ornament with the festival logo on it. When I finally do go Disney ornament shopping, I’ll add some pics here. 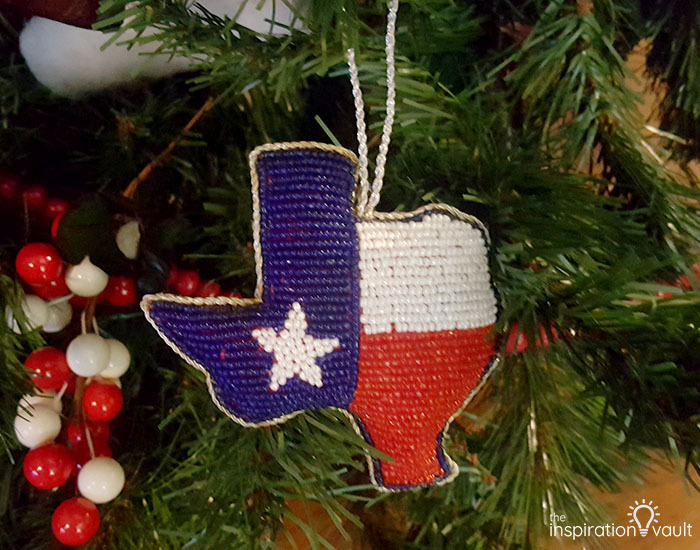 I may have mentioned I’m from Texas originally and for the longest time after moving away, I tried to hold on to being a Texan. 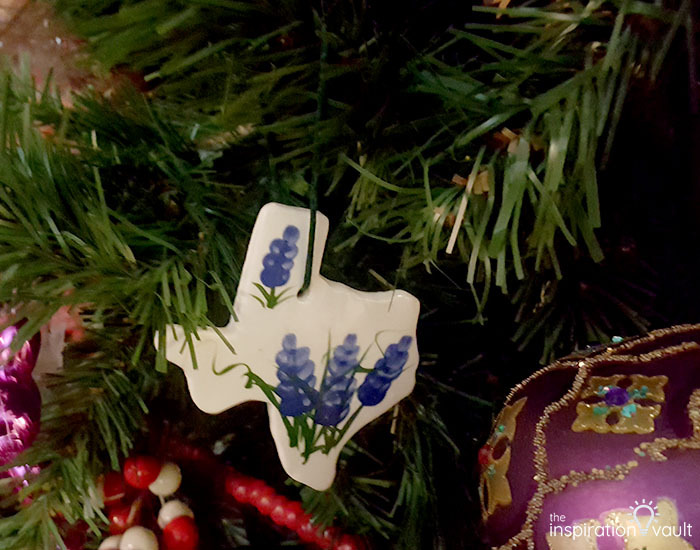 So for several years there, when I went back to visit, I’d grab a Texas-themed ornament. The beaded one is my favorite. 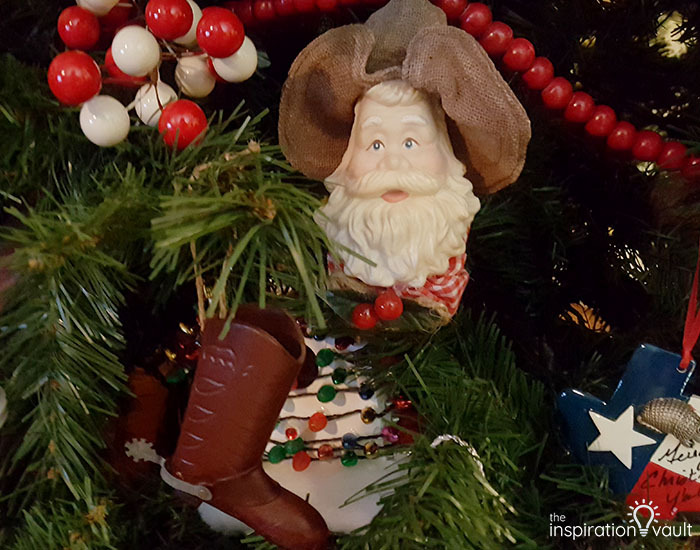 Also, back when I was first starting my collection, this cowboy Santa and cowboy boot reminded me of Texas, so I usually include those as well. 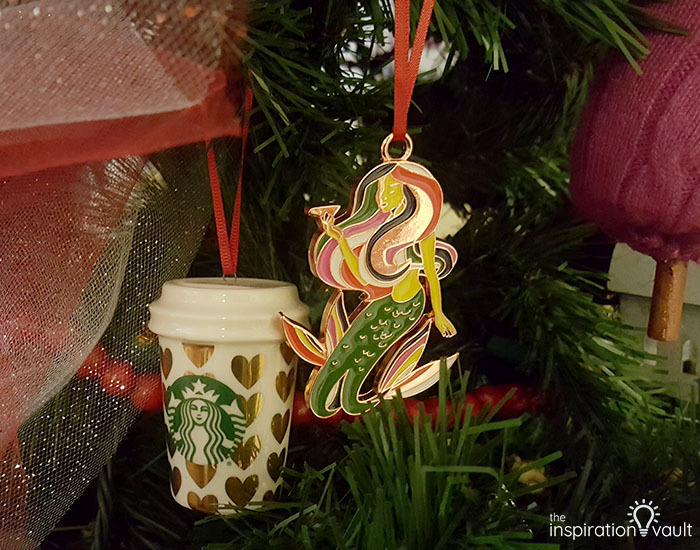 Well, I guess I’m collecting Starbuck’s ornaments now, too, lol. My daughter has bought me a couple of them so far and I absolutely love the miniature cup ones. I’ve already spotted the new ones for this year, so I’ll have to add any that I get to the pics here later. 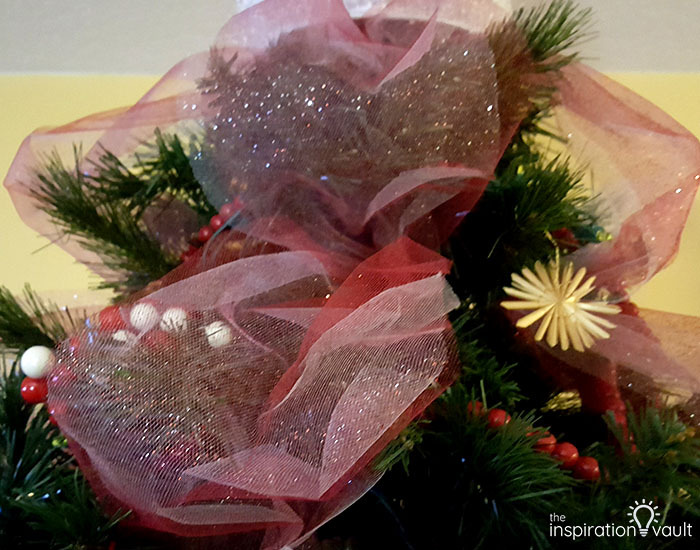 I decided to add some white and red tulle to My Family Christmas Tree this year to add some dimension and color, as well as some of these red and white berry pics. I think they both compliment the red and white of the Santa hat topper nicely. It’s funny, but I have so many of those berry pics from the Michael’s after Christmas $4 grab bags that I don’t know what to do with all of them. 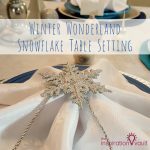 I also added a wicker Christmas Tree collar around the bottom instead of a tree skirt. I absolutely love how it looks! It almost looks like the tree’s trunk. That’s it for this year! 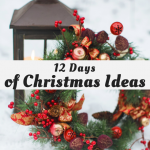 I’ll also be doing a reveal for my Gone With the Wind Christmas Tree for the 12 Days of Christmas Ideas Hop, so be sure to check back next week to see the details. 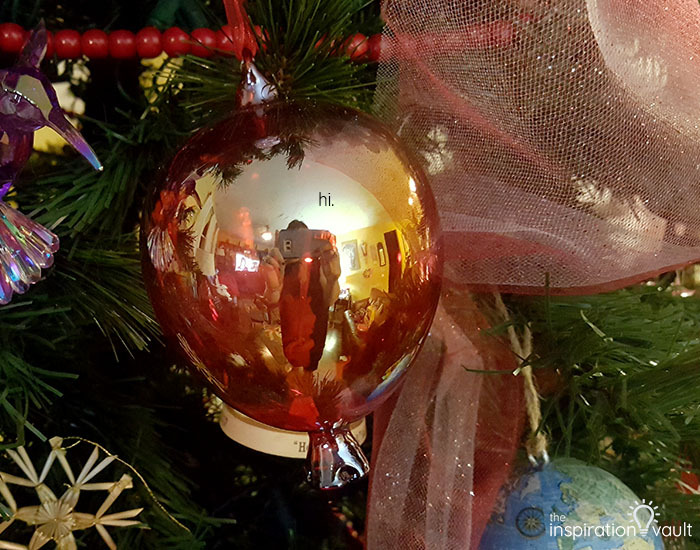 Now let’s go on a virtual tour of everyone else’s Christmas Trees! Which one is your favorite? I know I’ll be looking at all of theirs to find some new inspiration for all my different trees. Beautiful tree! I also love shopping for some decor at Cracker Barrell my mom and I always make sure to hit it up after the holidays for some good prices. 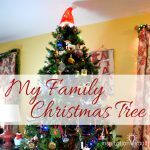 Sadly my tree did not make it this year and I had to buy another one. It’s funny how we get so attached to them. I love all your different ornament collections!! Whenever we go on trips I grab an ornament (or key chain to turn into an ornament) So I can hang it on our family Christmas tree! That is a genius idea! I have the perfect Harry Potter keychain to make into the ornament I can never find there. Such a fun tree! 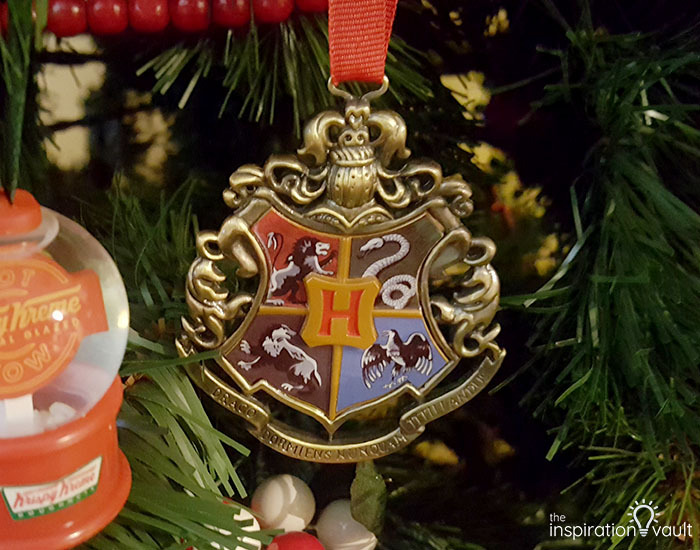 I have that exact same Hogwarts ornament on my tree from my last trip to Universal. 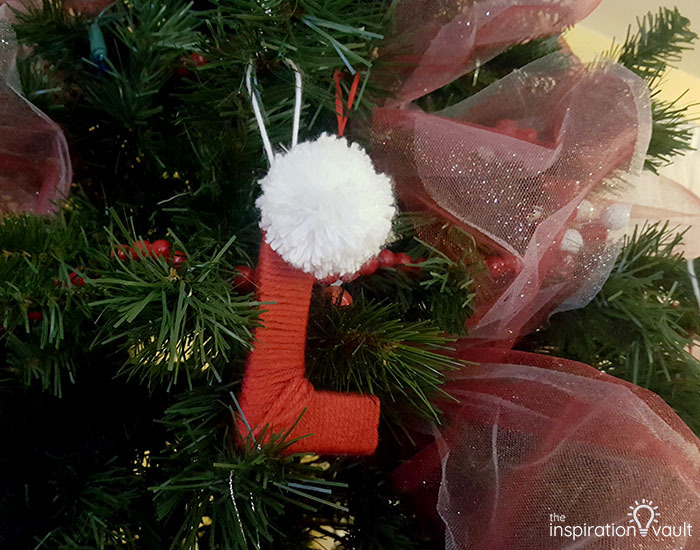 And that balloon animal ornament would just have to be on my tree too if I saw it in a store. You did a great job this year and I hope to see all the new things next year. Your tree is so sweet. I think trees with ornaments that have personal meaning are the best trees and you’ve got some great ones that just made me smile. The balloon animal one is the best. I love your pretty tree with all of the unique ornaments! 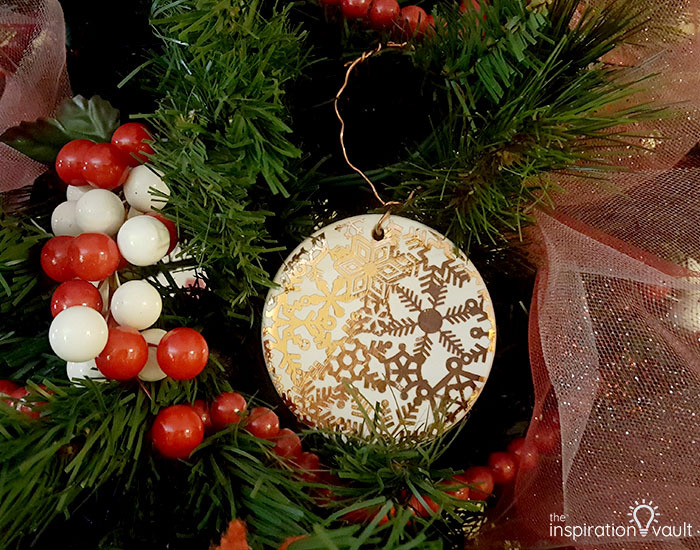 What a fun way to decorate for Christmas. 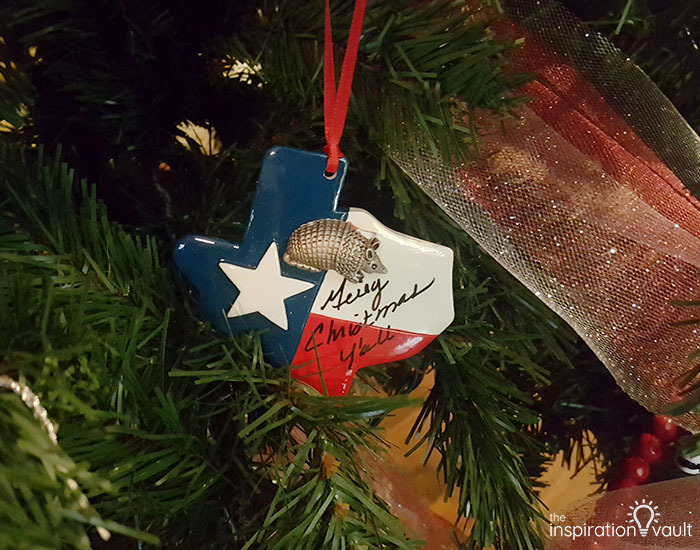 So many memories and special reminders your ornaments hold for you. 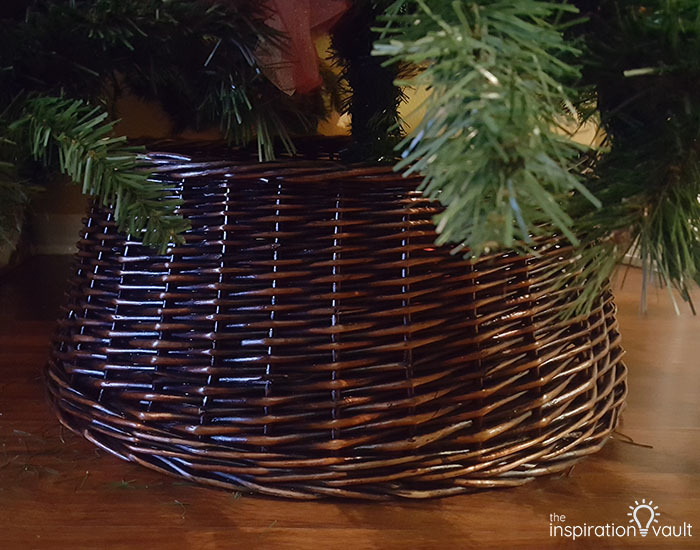 I love the wicker collar around the base, it grounds your tree perfectly. It was great that you found 10 ornaments at Cracker Barrel, I don’t get in there enough, and I know they have such great gift items! It is great to be hopping with you!! 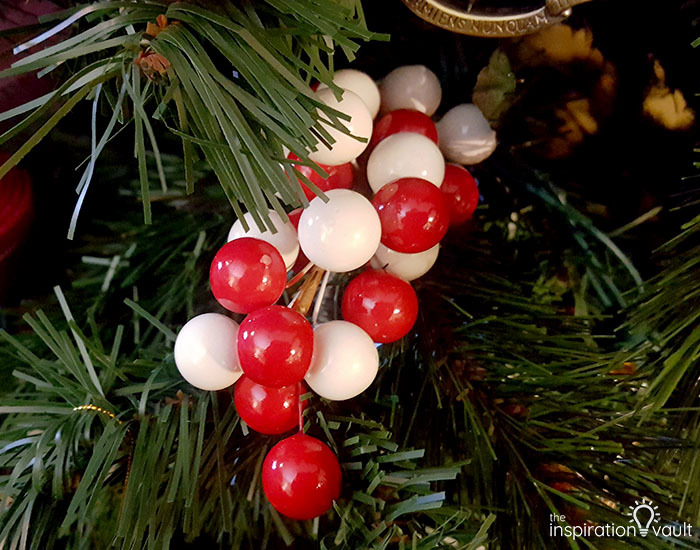 I love all of the special ornaments you have on your tree. I collect them throughout the year, too. Your tree is lovely.